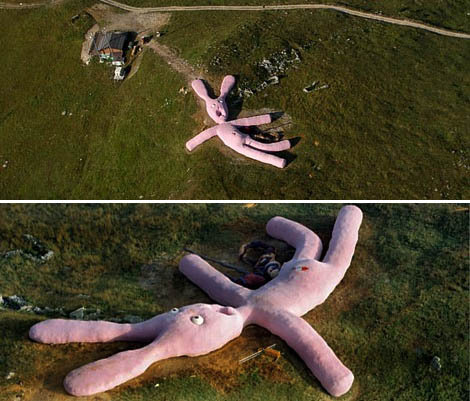 Word of advice: finish your projects! The unfinished knitting projects tend to increase entropy ten-fold and fill all the space allowed for them - these misshapen lumps of yarn can breed in the dark corners voraciously. On the left - just an innocent Cthulhu Penguin. 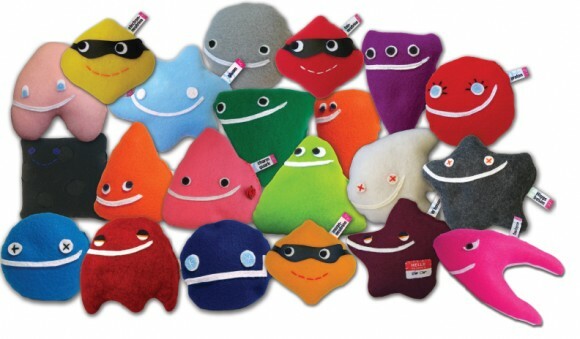 On the right: Psycho Tomato from the Vegetable Liberation Army. 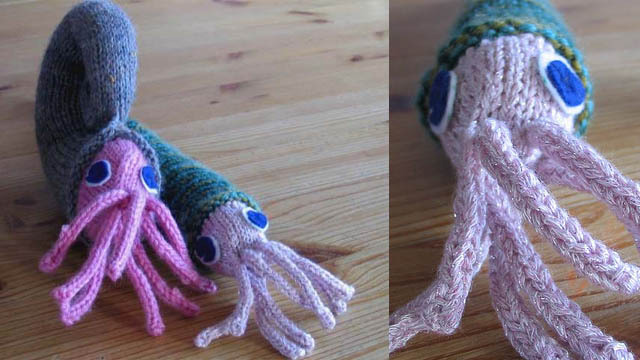 One day the menace of the Cthulhu will awaken and terror will fill the Earth... all will die, except hardy knitters with their offerings and cthulhu idols will be spared. Believe it. 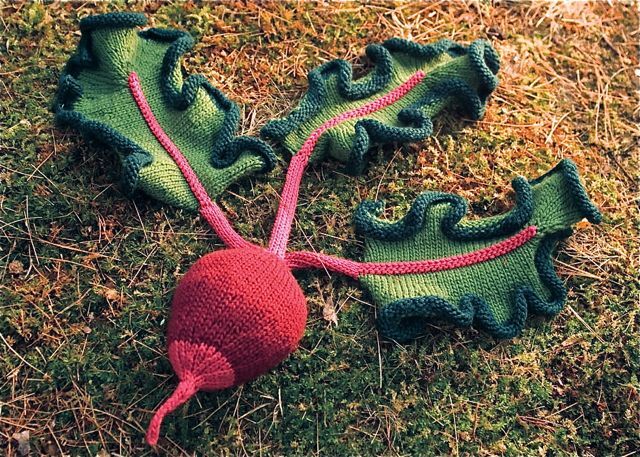 Knitted vegetables... maybe this propaganda will cause your man to eat his vegetables. Maybe not. See the whole catalog with descriptions here. Great video, anonymous - putting it in link latte. Great article, but I just wanted to point out that knitting and crochet, while both done with yarn, are different crafts. 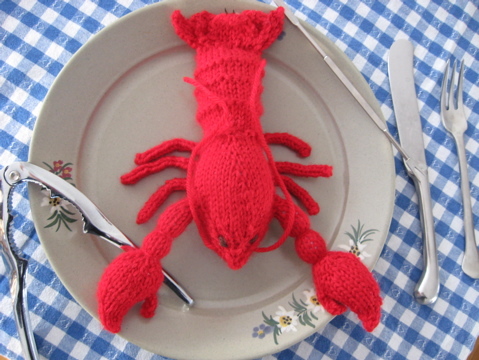 Knitters do not create crocheted objects and vice versa (well, some of them do, but you know what I mean). 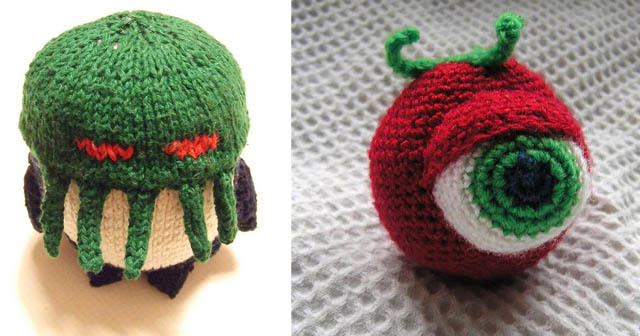 Of your pictures, the Cthulhu penguin, the eyeballs, the gollum hat, and Bender are definitely crochet. 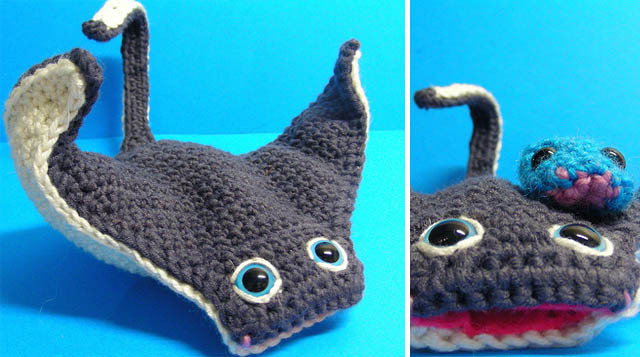 The rest are either knitted or a combination of the two. 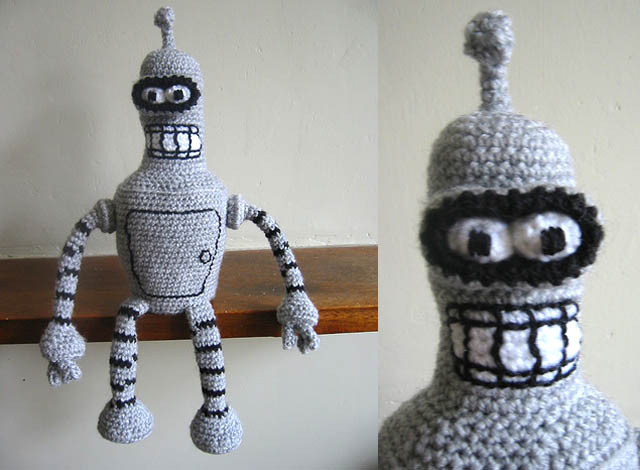 check the animations there too - more knitz. 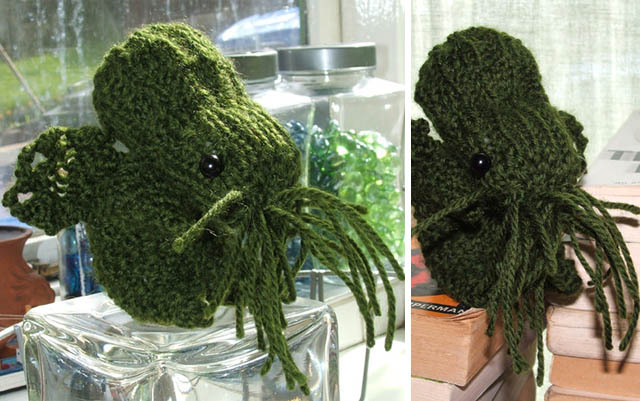 Actually, the Cthulhu penguin is knitted. 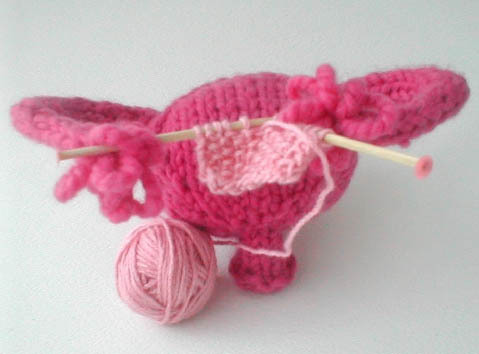 The pink Cthulhu above it is crocheted. Oh, while we're at it the goal of creating these idols is not to live, it's to be eaten first. 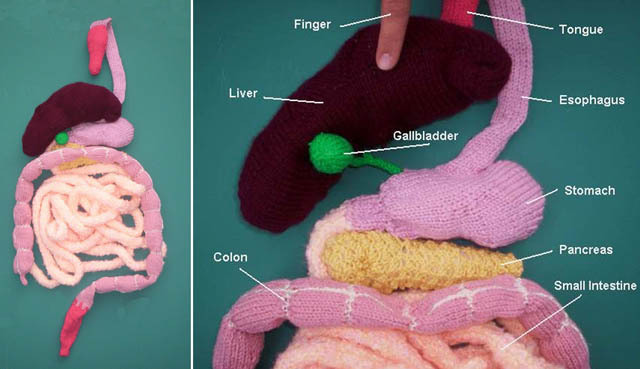 Of all the photos, 13 of them depict crochet, not knit. 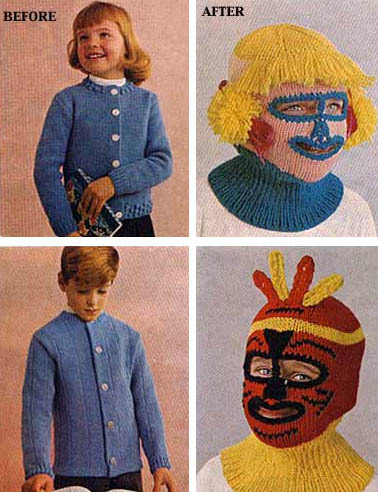 And the funny thing is, the ski masks are dissed as crochet but are knit! 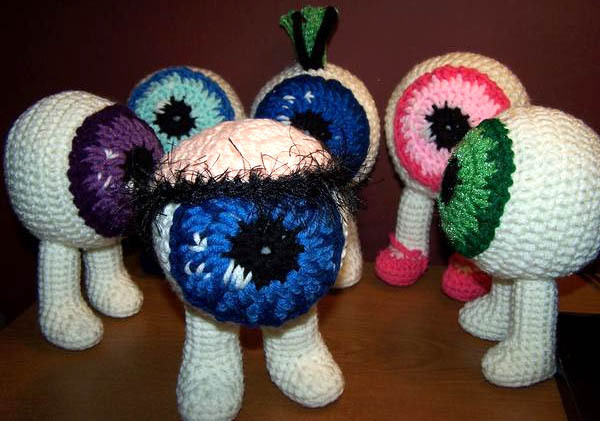 I'm a big fan of strange crochet. 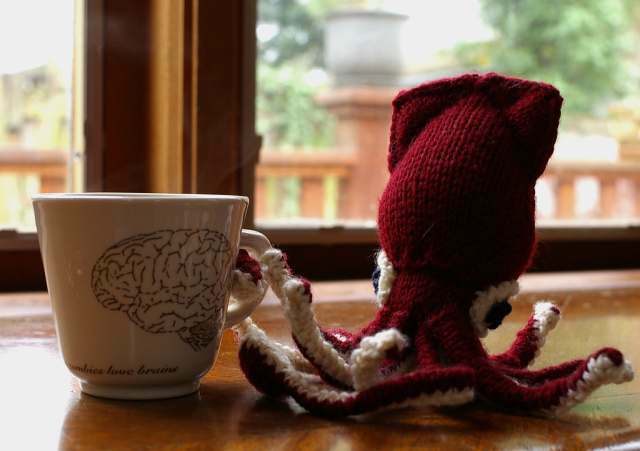 that is really great - I aint letting my knitting near my coffee! To non-needleworkers, a good rule of thumb is to look for material that looks like its made up of a bunch of tightly-packed Vs. That's stockinette stitch, your basic knit stitch. (Knit when working on the right side, purl when working on the wrong side.) 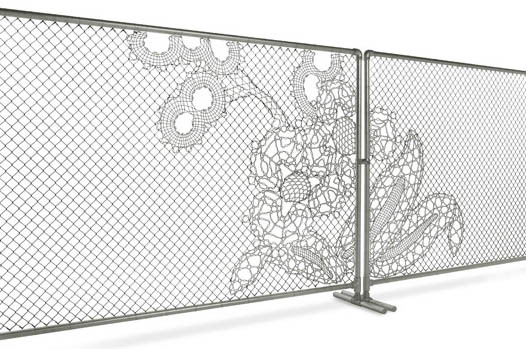 There are other stitches, like garter stitch, which looks like rows of little interlocking arches -- or like cheap fake chainmail, which is often garter stitch, spray-painted silver. (Convincing only at a great distance. Most of the knights in "Monty Python and the Holy Grail" wore garter stitch fake-mail, because it's cheap.) 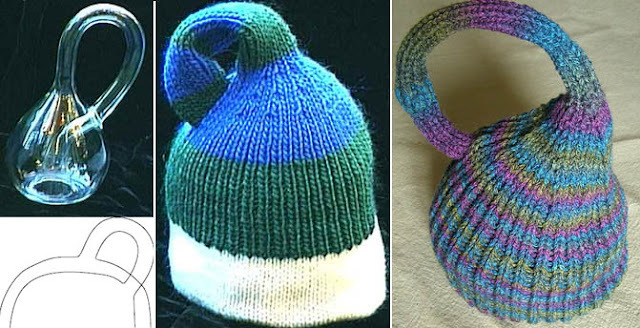 But most knitting revolves around stockinette stitch, like the stuff shown above, so for these examples, that test will give you a good idea of which ones are knit and which ones are crocheted. Man, I *love* that squid at the top of the page. Absolutely gorgeous. The nudibranch is stunning as well. It's too bad the gal with the Dr Who patterns was forced by the BBC to take them offline. 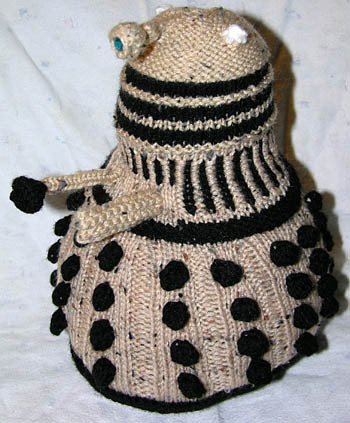 She had this awesome Ood that would've looked great next to the Chthulu knits.